Ice Cube stopped by The Talk recently to promote Ride Along 2 and discuss N.W.A. 's Rock And Roll Hall Of Fame induction, along with the recent Oscar nomination for Straight Outta Compton. He also suggested that he will attempt to spice up his Coachella performance with an N.W.A. reunion. "I've got some tricks up my sleeves," he said near the seven minute mark. "I can't reveal it all, but I'm gonna try to bring the members of N.W.A together. 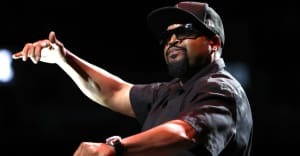 Give everybody a little history lesson on Ice Cube and N.W.A., Westside Connection, everything I've been doing over the years. We've got some great visuals; it's gonna be a great night. The same night Guns N' Roses get back together: it's gonna be a great night." Back in July, when asked about the possibility of an N.W.A. tour, Cube responded, "there's definitely a possibility. We've been talking about it. It's just really about promoters coming together and putting together something that works for everybody. It's definitely, definitely possible."